Summerhill has been specializing in lighting since 1995. We carry a huge selection of antique chandeliers, sconces, table and floor lamps. All of our antique and vintage lighting is refurbished with proper wiring for the American market. Each of our antique chandeliers and antique sconces are complete. We endeavor to keep the original flavor of the item, adding only the appropriate decorations needed to complete the piece. Summerhill carries many varieties of antique and vintage chandeliers. In the shop one can find brass, bronze, wood and crystal/glass chandelier frames. Each chandelier is unique. Although we endeavor to keep the appropriate style, there is a certain artistic license taken with the choice of crystal used to update the chandelier with better quality prisms. It is typical for these old charming chandeliers to arrive at the shop without all of the original prisms. Each rewired fixture has their chandelier sockets covered with attractive sleeves. It is our desire to repurpose these antique chandeliers to fit our modern life. There are several “styles” of wall sconces found on the secondary market. Ours lean toward the more decorative French/Italian styles with fabulous crystals dropping from bead chain, as well as classic undecorated wood, brass and bronze sconces. Many are gilded wood and metal. 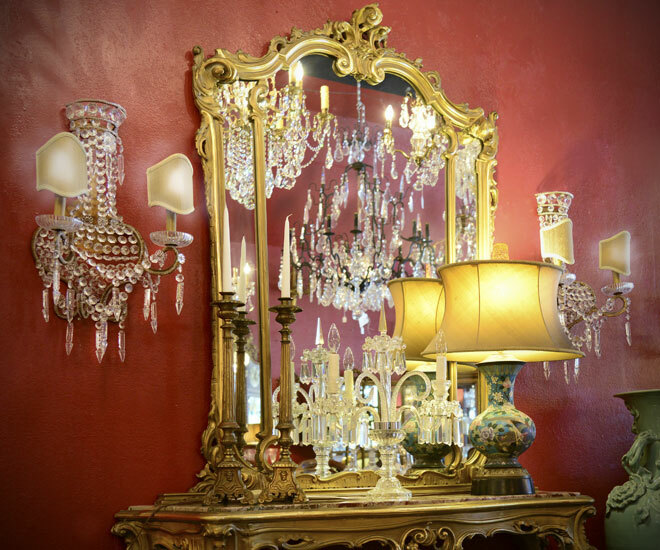 We also carry the traditional “Maria Theresa” style vintage sconces with glass arms held together with crystal rosettes, typically dripping with crystal prisms and bead drape. Each socket is covered with pretty socket sleeves in various colors which can be easily changed to accommodate a client’s specific look. We carry on average 100 lamps in the shop at all times. Many date back to the late 20’s but our inventory spans the 20th century. Included in our vast inventory are brass, bronze, ceramic, porcelain, crystal and iron bases. Some of the more notable styles are the cool mid-century Venetian Glass bases, Asian bronze and porcelain, mid-century Marbro, classic Chapman, Frederick Cooper, Waterford, Baccarat and of course the “little black dress of the lamp world,” the elegant marble. Each vintage lamp that comes into our shop is rewired for the American market and thoroughly cleaned. Add a beautiful custom lampshade to update a fabulous lamp for the 21st century. Summerhill carries a vast inventory of custom lampshades in a great variety of styles, fabrics and striking colors. Lampshades come in a variety of shapes, within which are several sizes, and rings of fabrics and trims from which to choose. We carry both soft back shades with linings in various lining colors as well as hardback shades which offer a larger variety of sizes and are generally less expensive. We also offer custom shades, made specifically to your order, from the frame to the customer’s own fabric, to create a completely unique finished lampshade. Adding a beautiful lampshade to a vintage lamp can breathe new life in a lovely old lamp and make it accessible to the modern décor.